Every so often we are confronted with wonderful and mysterious transportation devices (see Chinese Tunnel Bus). Today, we happen to come across the Sistema Monorail Con Funiculares (or the Monorail System With Funiculars) — a conceptual transit system designed by ECOLVIAS from Medellin, Colombia. There’s not much information about this technology but it does make me wonder what type of advantages/disadvantages one might discover if you fuse monorail technology with cable cars. Perhaps it offers greater stability, capacity and/or speeds? Or maybe it’s as simple as being able to travel in style onboard teardrop-shaped cabins. Without any additional details it’s really anybody’s guess at this time. But perhaps our engineer readers have a better idea and could provide us with your thoughts! Big thanks goes out to Guenther for the link. Banana Cableway. Image from Marietta College Biology and Environmental Science Department. Cable technology is good for a lot of things — there’s sightseeing, transporting minerals, public transit and yes, even relaxing in hot tubs. But a form of cable application we really haven’t address so far is transporting agricultural products. Believe it or not, many ropeway systems around the world are used to transfer everyday food and plant items such as bananas and roses. The manufacturer claims that systems can carry up to 90 tons of fruits on only 1.5 gallons of fuel! If accurate, that’s the equivalent of transporting 18 elephants with less than two milk jugs of gas. Talk about efficiency! And plus, maintenance is simple, no road construction and paving, just the simple periodic replacement of wheels, springs and oil filters. The application of cable technology in more farming communities has the potential to make a huge impact. Dr. Shankar Krishnapillai, a professor at the Indian Institute of Technology Madras, has spotted a huge potential for increased usage of cableways in small, rural farms in India. The professor has recognized that many small farming operations struggle to hire sufficient manpower, especially during the labor-intensive harvesting season. Dr. Krishnapillai’s solution is through the creation of a portable cableway. By his estimates, a simple system would still cost $4000 USD and would require four persons to operate. It’s unclear though how much his innovation can transport but ultimately, the main advantage lies in its portability. Since farmers only need the system for 10-15 days a year, the costs to build a cable system can be shared amongst many families. While I’m not a farmer by any long shot (nor have I grown anything of significance), the concept of building a lightweight and transportable agricultural cableway is quite fascinating. If built, designed and costed properly, maybe one day cable systems can solve these labor and scalability issues in small farms and help bring much needed economic development in the poorest of regions. The super miniature Motocompo scooter next to HONDACITY subcompact hatchback. Image from Wikipedia. As more and more of the human population migrates to cities, the need for intelligent urban transport solutions grows ever more urgent. And perhaps as a response to these circumstances, Honda was responsible for developing a very simple, ingenious and cutting-edge solution (at least in the 1980s) to the dreaded urban commute. The Motocompo, a super miniature scooter, has been aptly nicknamed by its cult-like followers as a “briefcase motorcycle” or a “bike in a box”. First launched in 1981, buyers of the Honda City or Honda Today had the option of adding on a Motocompo to their purchase for only $350. The scooter with its side handles and collapsable steering shafts allows it to be easily transported and stored almost anywhere. Unfortunately, these units were not available to most consumers as they were only sold domestically in Japan. Motocompo stored in trunk when not in use. Image from Wikipedia. And for the cramped and dense metropolises of the rising sun where living space comes at a premium, the Motocompo’s space-savviness appeared to be an ideal solution. Makers optimistically estimated that they would sell 10,000 each month but in reality, only 53,000 units were bought over the course of 2 years until Honda pulled the plug in 1983. Due to its rarity, its status today is merely relegated to a collector’s item where one can cost you upwards of $10,000 USD! It’s not entirely clear why the Motocompo never caught on but Honda has certainly not forgotten about this concept. As personal portable mobility demands will likely intensify with growing urban populations, an eco-friendly and compact scooter with great mileage (100 mpg) may finally find its niche amongst the billions of city dwellers. In fact, the automaker completely redesigned the scooter and unveiled it in 2011 as the Motor Compo. However, a few years down the line, there’s little word if or when the first of these vehicles will ever hit the road. If history provides any lessons, for the Motor Compo to have any chance of success they may need to do some work on their previous somewhat funny, yet incredibly corny advertisement. We recently received an awesome Youtube link of the infamous truck transporting ropeway that’s being used to help construct a $2.35bn hydroelectric power plant in Switzerland. It’s been reported that the cable car systems are capable of transporting a payload of more than 200t! Equally or even more impressive is the fact that the power plant is expected to be complete by 2015 and will generate as much energy as a nuclear power plant! Thanks to reader Quentin for the video! For those who love driving, the future looks more and more bleak. Yesterday, Google gave its followers an update on its self-driving vehicles. According to its official blog, their autonomous vehicles have logged over 700,000 miles (1,100,000 kilometres) so far. The video posted below shows some of the incredible advances that have been made which now allows the vehicles to operate safely in complex urban environments. For example, the onboard computers and sensors can now detect hand signals from cyclists and construction cones. Right now the vehicles appear to operate only on predetermined routes with very high levels of map detail. However, the team plans expand their routes and have their vehicles operate throughout the city of Mountain View by summer’s end. They understand that mastering the streets in a mid-size town of 74,000 is no small feat, but they still have a long way to go before autonomous cars can handle more tricky traffic scenarios typically seen in major metropolitan cities. So until then, drivers like those in Addis Ababa, Ethiopia (see below) will still need to rely on their quick reflexes and gusty driving techniques to conquer local traffic conditions. Hyperloop Concept Vehicle. Image from Tesla Motors. In case you haven’t heard by now, Elon Musk — billionaire investor and founder/CEO of Tesla Motors, PayPal and SpaceX — unveiled plans for an ultra-fast, air-cushioned, solar powered transport tube system called the Hyperloop. Proposed alignment between San Francisco to Los Angeles. Image from Tesla Motors. Based on his current proposal, he sees this technology transporting passengers between San Francisco and Los Angeles in 30 minutes. As expected, once this concept emerged, there was a mixture of excitement and skepticism. I’m not a scientist or engineer so I can’t comment on the technological feasibility, but experts seem to suggest that this system is possible with existing technology. So in some ways, it’s not completely innovative. In fact, many similar ultra high speed systems of this variety have been explored in the past — however none have reached the prototype stage. I could only speculate why that is, but imagine that the initial start-up costs and associated complexities are enormous. Too much to risk for any one person or entity to take on, even for a billionaire like Elon — which might explain why he’s not personally building this concept but instead hoping to pass it onto other investors. Being a transit nerd, this idea is fascinating and I’d love nothing more than to be able to hop in one of these tube capsules in the future. However, until a real-life model is designed, built and tested, it simply remains an idea. Perhaps one day we’ll finally see get to see ultra-super-high speed transit, but exactly when is anyone’s guess. I must say that the buzz generated by this technology makes me hopeful and excited for the future — that smart, talented and bright scientists continue to push the envelope to develop new transportation solutions. However, what I’m less enthused about is Elon’s suggestion that this will be the fifth mode of transport — planes, trains, cars, boats and the hyperloop — cause if he had read our blog, I’m certain he’d say sixth. Guest post by Charlotte Boffetti. Eiffage is a large construction and civil engineering company in France. In 2007 it started a research lab called the “Phosphore” to think about the future of cities. After years of research and development, last April it presented a model called “the city in 2030”. The goal was to develop and present a sustainable city model that addresses the future changes in demography, technology and the environment. City in 2030 and Modul’air concept vehicles. Image via UrbaNews.fr. Amongst all the technologies that were conceptualized, one of the most interesting ideas was an urban cable car called the “Modul’air”. 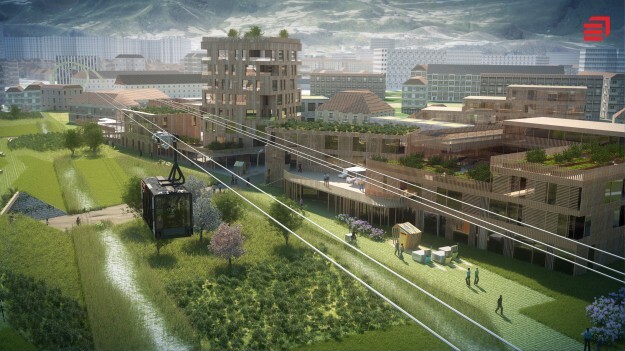 It is a hybrid transport system where a cable car operates in both an aerial and terrestrial fashion. The cabins are designed in a way to not only transport human passengers, but also cargo and waste materials. POMA, a French cable car company, helped develop the idea of the Modul’air as a carbon free and flexible transport solution for the future. It functions primarily to complement existing urban transport networks. Find something interesting on urban gondolas and would like to share, contribute or write a guest post? Click here find out more.